This article won second prize the British Guild of Travel Writers’ 2013 writing competition. Fidel, strutting around in a broad cowboy hat, his face baked a leathery brown, greets me with an enormous smile and two kisses as if I am an old friend. We have, in fact, just met – but he is to be my new “dad” for the week, as I will be staying in his immaculate little bungalow in rural Viñales, western Cuba. In this tranquil town, donkeys and oxen are as ubiquitous as the classic 1950s cars, and the swaying tips of banana plants peek above the flat roofs of colourfully painted houses. The Valle de Viñales is a lush, wide valley that was created when underground rivers eroded the limestone floor around 100 million years ago, causing the earth to collapse in on itself. The valley is surrounded by soaring mogotes – steep-sided rock hills – that once formed the walls of the vast underground caverns, and now comprise one of Cuba’s nine UNESCO World Heritage Sites. Drinking fresh papaya juice in rocking chairs on the porch, Fidel, his wife Maricel and I introduce ourselves, and discuss how I found my way to the valley. I was in fact given Fidel’s address by his old friend Carmen, whose room I had rented in downtown Havana. And Carmen was found thanks to her architect brother-in-law, Roberto, whose gloriously restored colonial home I had stayed in before that. This is the magic of Cuba’s remarkably efficient casas particulares system, in which visitors can rent budget rooms in private houses across the country for a personalised Cuban experience. The casas are touted as the independent traveller’s way to discover Cuba – but the owners’ networks of friends and extended families prove to be far more efficient than your average tour operator, able to provide tailor-made meals, transport, lodging and excursions. An old university friend has horses to ride; a brother has a 1958 Chevy to taxi guests to restaurants; a mother-in-law gets up at 6am to prepare a breakfast of tropical fruit. Maps are pulled from drawers and marked with must-sees, bus stops, family restaurants and no-go zones. I’m told which streets are safe to walk after dark and given aloe for my beach-burned skin. It’s like having a set of parents in every town, and each departure inevitably involves a rather emotional farewell. My new “mother” Maricel takes care of the meals. “Todo es posible” is her mantra – “everything is possible” – and she repeats this phrase with her constant, mischievous smile. If an early breakfast is required before a day trip, if I wish to swap pork for chicken, or do last-minute laundry – everything is always possible. My favourite side dish is a smoky mix of black beans and white rice that fills the belly far quicker than I’d like. The Cubans call it moros y cristianos – which translates literally as “Moors and Christians”. Maricel happily dictates the family recipe so I can jot it down, before taking me to see the raw beans, harvested by Fidel and now drying on her roof under the Caribbean sun. “Can I see where he grows them?” I ask. As I awake to Viñales’ natural alarm clock of roosters and braying donkeys the following morning, the aroma of Cubita coffee curls around the house. Breakfast is a feast of pineapple, papaya and sharp, pink guayaba, followed by bread with cheese and homemade guava jelly. 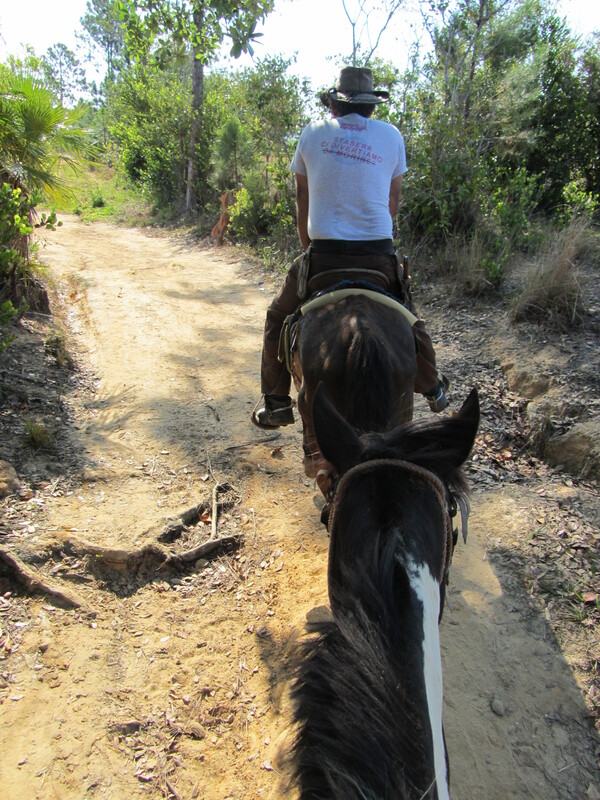 Today is to be spent with Fidel and an obedient little horse called Mojito who will carry me in the Caribbean heat to Fidel’s organic farm – which also just happened to be one of the most impressive viewpoints in all of Viñales. A happy couple of hours are spent crushing aromatic basil, oregano and anise between my fingers and crunching on baby carrots just-pulled from the organic soil, against one of Cuba’s most gorgeous backdrops. Farm workers serve freshly squeezed “anti-stress” juice – a fragrant mix of mango, pineapple, mint and lemon balm, sweetened with a local honey. Revived, and less stressed than ever, I hop back onto Mojito, who carries me dutifully along the dusty trail back home. As the sun sinks behind the mogotes and the sultry heat fades, I recount the day’s adventures to Maricel on the rooftop as we share a chilled Bucanero beer. She recommends a trip to a tiny, uninhabited island, a hike to the “Cave of the Indian”, a night of live salsa in the plaza… and my week in Viñales begins to fall smoothly into place. As the time finally comes to leave, the three of us exchange warm hugs and kisses and gratitude. I swallow the lump in my throat as Maricel beams and hands me a large plastic bottle filled with Fidel’s dried black beans, so that the taste of Cuba can accompany me back to my real home. ViAzul buses travel between Havana and Viñales twice daily. They take around 3.5-4 hours, with a brief stop in Las Terrazas. Buses depart from the main ViAzul bus station in Havana, near the Zoological Gardens. Tickets should be booked in advance. Find and book a casa particular through www.mycasaparticular.com. Fidel and Maricel’s house is not listed here; however, you can arrange your stay with them via Roberto’s casa particular in Havana. Most casas charge between 15-30 CUCs (Cuban Convertible Pesos) per room, with the cheaper casas being found outside of Havana. Rooms usually sleep 1-3 people, and the price does not vary depending on the number of guests. Breakfast is usually an additional 3-5 CUCs, dinner and/or lunch can also be arranged at around 10 CUCs – and this is guaranteed to be the best and freshest food you will find in Cuba! 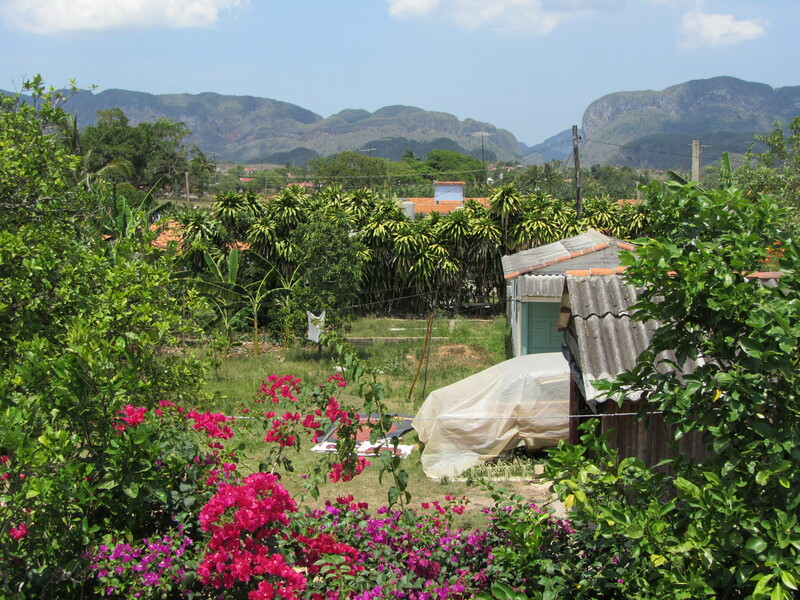 Tags: casas particulares, cowboy, cuba, farming, food, homestay, UNESCO, vinales. Bookmark the permalink. Please make it clear that that is not Fidel CASTRO. Hi Sandi, if you are already an experienced volunteer and traveller then I would recommend contacting the community tourism organisations directly, rather than going through a voluntourism organisation. Examples include the Uganda Community Tourism Association, TESFA in Ethiopia, and Mano Cambiada in Colombia. These work with various community tourism enterprises and conservation projects, and will partner you with a project that is most in need of assistance, and most compatible with your skills. Good luck! Of course – Sandi the couchsurfer! Sorry – it didn’t click. I hope you are continuing with your adventures Sandi – and let me know if you find any interesting volunteer opportunities!